With my head mostly in the past like in my last post, i thought it was time i brought myself to the present and dabbled with a couple of new pieces. 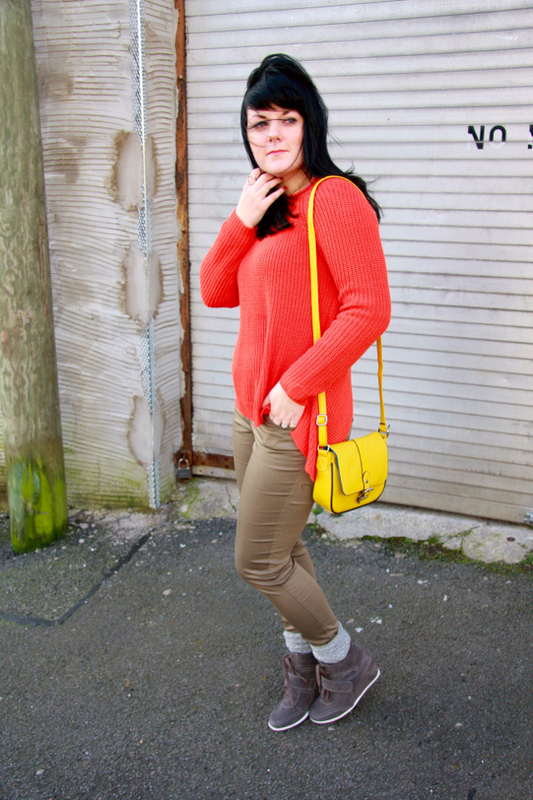 I also picked up this rather lovely orange knit, khaki skinnies and yellow bag. It was a good shopping day (not so much on the food front, it’ll be beans on toast allll week,haha!) Thanks Tesco, every little does help! 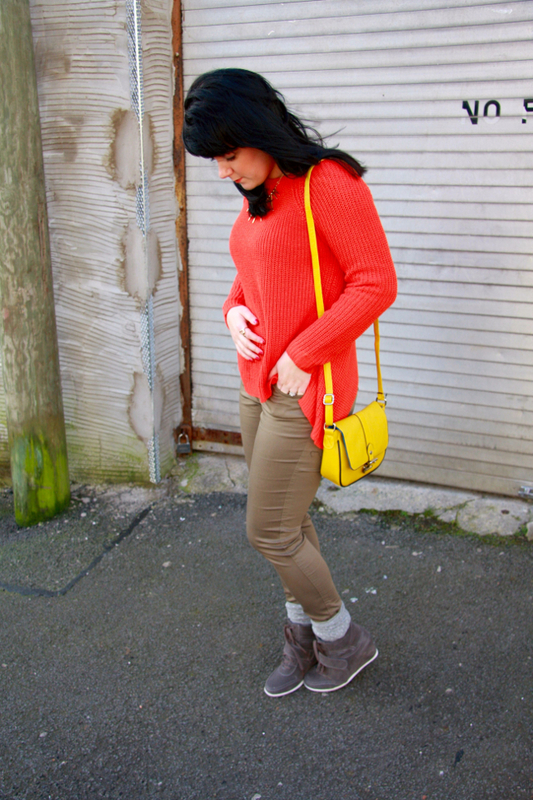 I am really in to orange right now, i’ve just picked up recently a bright orange dress too. 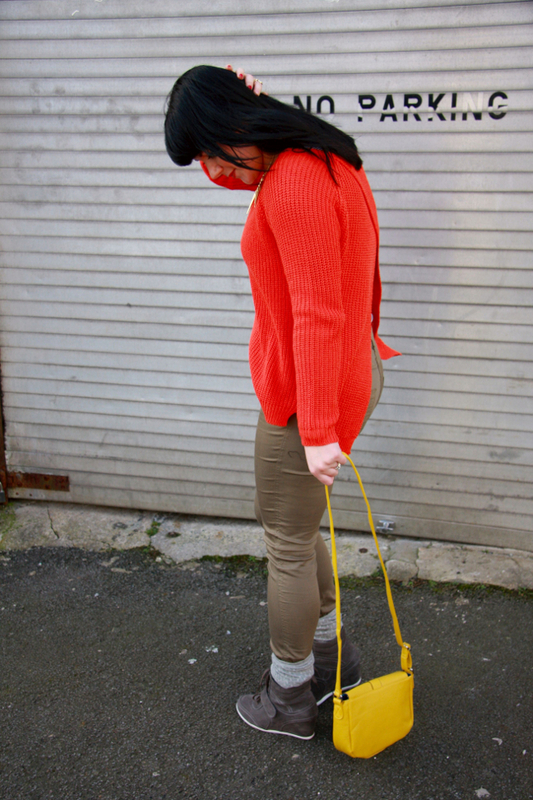 Who’d have thought it… orange! I mean it’s not a colour i normally gravitate towards (normal being red, navy or mustard!) but its fast becoming a current favourite. So i’m trying to think of ways to re mix these bad-boys to make it a worthy investment (£19 is a bargain investment even without vouchers dont you think!). Anyone have any ideas? I already i have a dress lined up for them next but feel i need some sneaker-wedge type inspiration. Anyone tried this or have you pinned any styles? I would love to see! 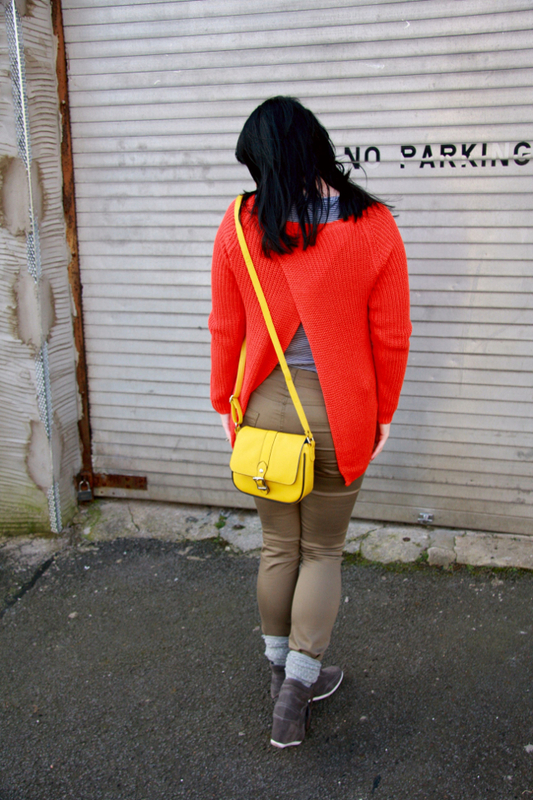 Love the yellow bag–my favorite color. 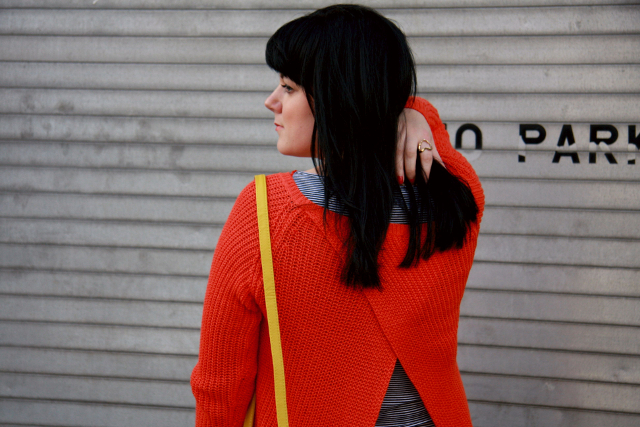 Love the back of this sweater too! have been thinking about the wedge style sneakers…we will see….. I think they look awesome on you! If my feet weren't so persnickety, I would give them a go. I especially love your orange sweater! The back detailing is so unexpected and I love it. I, too, have been gravitating to orange lately even though I've always disliked it in the past. Guess you can teach an old dog new tricks after all! They're fabulous! It's perfect how you styled them. Great sweater, btw! I like them! The neutral color makes them much easier to remix. I really like them with the brightly-colored comfy sweater and trousers. Your yellow bag is adorable too! I thought I'd hate the sneaker wedges, but actually I don't! I think it's because these ones are a nice colour and not overly 'Sports-luxe' because I dislike that trend. I really like these sneaker wedges, I think it is the colour that has persuaded me! Great find! All in a grocery store? Love the color on sweater too. I love the yellow and orange combo! You look great. Love the yellow bag. I think those wedges have to be on the right person. I mean you definately pulled them off but I'm not sure I would! The yellow bag on the other hand is nice and something I would definately use. Tesco has some great bargains as do the other big name supermarkets. That bag is such a perfect color! 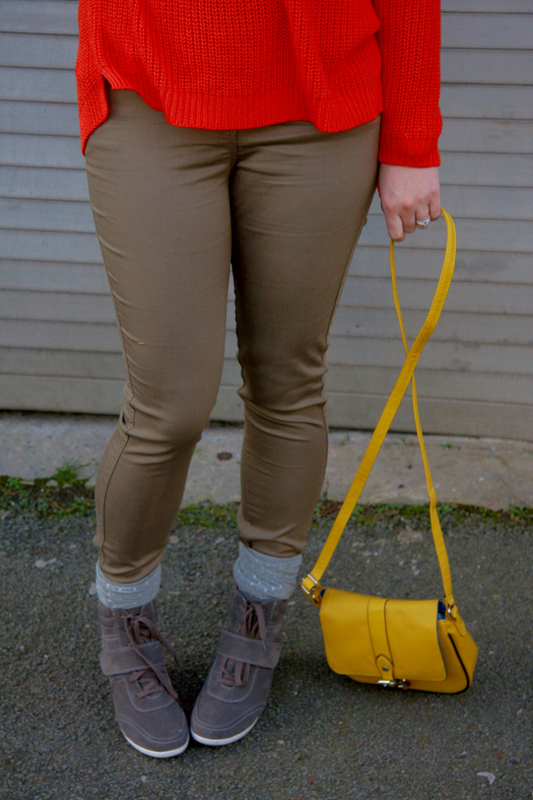 I have yet to try my own pair of sneaker wedges, but I think this simple pair looks amazing on yoU! So fun seeing you in a different than your norm outfit, you're too cute! I especially love them with those little polka dot socks! Hope you're having a great start to your week! The sweater is so cool! loving the pops pf color this week! Awesome!! I thought I hated those sneakers until I saw them on your feet in this very post. You're turning my world upside down. Black is white, up is down, fugly sneakers are cute…what's next..puppies are gross and anchovies are delicious? I am torn on wedge trainers, I may get a pair to try soon though. They look great on you worn with those trousers and the jumper.